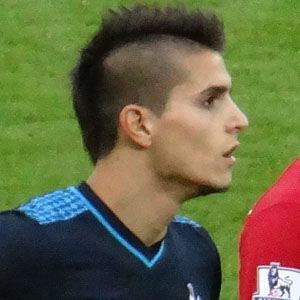 Attacking midfielder and winger who debuted for Argentina's national team in 2011 and joined Tottenham in 2013. He played for Argentina in the 2016 Copa Americana. He began his youth career with River Plate when he was just 7 years old. He scored 19 goals in 62 appearances for A.S. Roma from 2011 to 2013. He was raised with two siblings, Brian and Axel. He began dating Sofia Herrero in 2010. The transfer fee it cost Tottenham Hotspur to acquire him broke a record previously set by striker Roberto Soldado.